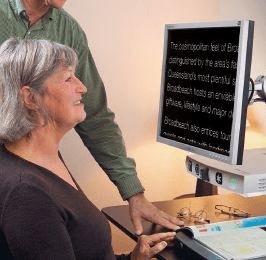 As my mom wrestles with the difficult combination of hearing loss and vision loss, I’ve grown more aware of the strengths and weaknesses of various assistive technologies. Many are disappointing, but the Humanware magnifier is working well for her. It’s basically a digital camera that projects onto a flatscreen monitor. You position your book or magazine on the flatbed, and zoom the onscreen text to the needed magnification. As I watched her use the device I could see room for improvement. Although the bed slides laterally and longitudinally, the action is a bit stiff. So she tends to slide the reading matter around on the bed, rather than sliding the bed itself. As a result, she winds up realigning the book, newspaper, or magazine more than would otherwise be necessary. With books, in particular, there’s also the issue of getting them to lie flat. I don’t think there’s any easy solution for that, but my mom’s OK with holding her books open on the bed. There’s really only one test that matters: Can she read? And the answer is yes. My mom has been a lifelong voracious reader. Her macular degeneration had gotten to the point where she simply could not read, and that was devastating. Audiobooks help, but not much. That’s partly true because of hearing loss, and partly because the audio gadgets she’s tried — CD players, MP3 players — lack the affordances she needs. The Humanware magnifier just works. There’s a big on/off switch, and a big zoom dial, and she can put a book, magazine, or newspaper onto the flatbed and read. Not nearly as fast as she’s capable of, but she can read. And so she does. You could get her a piece of plexiglass to lay on top of the book. Perhaps that would help? I think they make matte plexiglass. > Perhaps that would help? Turns out to be awkward, and more trouble than it’s worth. As a person who has been involved in the design of such products, there is no simple answer to the open book problem and movement of the x-y table. There should be an adjustment on the table to change the resistence and make it lighter to push for her. Another option is the MyReader from Humanware. A lot more expensive but her reading rate should iimprove dramatically.